New York State is now home to 400 breweries, surpassing the previous record of 393 breweries set in 1876. Sure, the craft beer boom produces eye-popping numbers like this all of the time now, but this one stands out a little bit. While breweries in some states are still fighting battles over basic stuff like being able to sell their own beer their own customers that specifically come and visit them, New York State encouraged the growth of a booming industry that has shown a legit economic impact outside its own fermentation tank walls. The number of breweries has skyrocketed in New York since Governor Andrew Cuomo hosted the state’s first Wine, Beer and Spirits Summit in 2012, with 243 new breweries obtaining licenses, and beer being brewed in 57 of the state’s 62 counties. Additionally, 202 new farm brewery licenses have been issued since the Governor’s farm brewery law went into effect on January 1, 2013, , mirroring the highly successful 1976 Farm Winery Act that lead to the tremendous growth of wineries and grape production throughout New York. The new farm brewery license allows craft breweries that use ingredients grown in New York to conduct onsite tastings, open restaurants, engage in self-distribution, and open up to five no-fee off-site branch stores anywhere in the state. In just five years, 202 licenses have been issued, in addition to 29 farm brewery branch stores with tasting rooms now operating throughout New York. The farm brewery law has also led to a resurgence in New York’s hop and barley production. According to Cornell University, in response to a rising demand for locally sourced agriculture, the acreage of hops grown in New York nearly doubled from 2014 to 2016, while the acreage of malting barley increased by 374 percent over the same two-year period. New York is also now home to thirteen malt houses, all of which have opened following the demand generated by the new farm brewery license. These have also generated employment and economic development for supporting industries, including bottling, construction, freight, printing and advertising, as well as growing agri-tourism in the state, augmenting New York’s $100 billion tourism industry. The first commercial brewery in Colonial America opened in Manhattan in 1632, after settlers quickly realized the state’s climate was ideal for growing hops and barley. New York’s agriculture sector expanded throughout the 18th century and received a significant boost when the Erie Canal opened in 1825, helping promote the use of locally grown ingredients in beer production – a strong suit of New York’s craft beverage industry today. Later in the 19th century the state benefited from an influx of English, German and Irish immigrants who brought with them brewing skills that propelled New York into a thriving beverage boom. Between 1840 and 1900, New York grew more hops and brewed more beer than anywhere else in the country, with the number of breweries peaking in 1876 at 393. By the close of the 19th century, developments in pasteurization, refrigeration, rail transport and bottling shifted the brewing industry from small-scale production for local consumption to an industry dominated by enormous breweries. By 1910, the number of brewers in the state fell to 194, while an epidemic of downy mildew devastated the state’s hop production, followed by the Prohibition in 1920, which finally killed off the industry. When beer production was legalized following the 21st Amendment in 1933, only a small handful of breweries in the state reopened. Today, a new generation of entrepreneurs are reviving New York’s position as a leader in craft brewing. 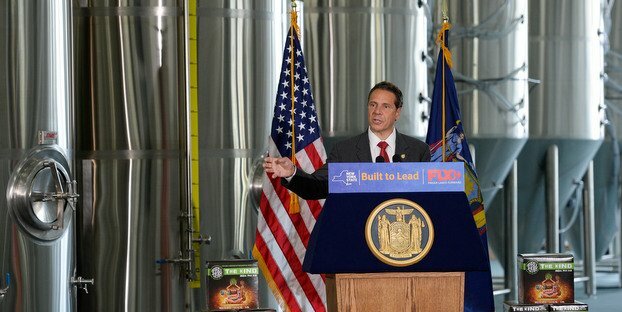 In October 2012, Governor Cuomo hosted the state’s first Wine, Beer and Spirits Summit, bringing together dozens of beer, wine, cider, and spirits producers, as well as farmers, researchers, industry officials, and tourism experts, who discussed with state officials, specific legislative and regulatory issues facing the beverage industry. Immediately following the Summit, the Governor implemented a host of regulatory changes to spur growth in the craft beverage industry, in addition to launching an aggressive marketing campaign to capitalize on the “buy local” movement. Additionally, institutions including Cornell University, SUNY Morrisville, the Geneva Experiment Station and Hartwick College’s Center for Craft Food and Beverage are now engaged in research and offering testing of barely, malt and beer quality, while colleges including Erie Community College, Niagara Community College, the Culinary Institute of America, Schenectady Community College, Morrisville and Hartwick now have programs to train New York’s next generation of brewers.